James and Mary (Turner) Hopkins, natives of Pennsylvania and of Scotch and Irish descent. They were married in Clearfield Co., Pa., Feb. 22, 1820. By this union there were five children, two living – Samuel G. and Miles S. James Hopkins died in Pennsylvania Nov. 10, 1828. Mrs. Hopkins married James Long, March 9, 1843. She died Aug. 12, 1876. Will of James Hopkins, late of Antes Township, Huntingdon County, PA; will dated 11 October 1828; probated 19 November 1828. Wife Mary; children mentioned, but not named. Executors: Samuel Johnston of Tyrone Township, Huntingdon County, PA and wife Mary. Witnesses: John Henchi, William McCauley and James Turner. Letters of administration granted to William McCauley on the estate of James Hopkins, late of Antes Township, deceased, 19 November 1828.
Letters of administration were granted to John Henchie on the estate of James Hopkins, late of Antes Township, deceased, 21 November 1828.
Letters of administration granted to Mary Hopkins, wife, and Samuel Johnston, on the estate of James Hopkins, late of Antes Township, deceased, 21 November 1828. 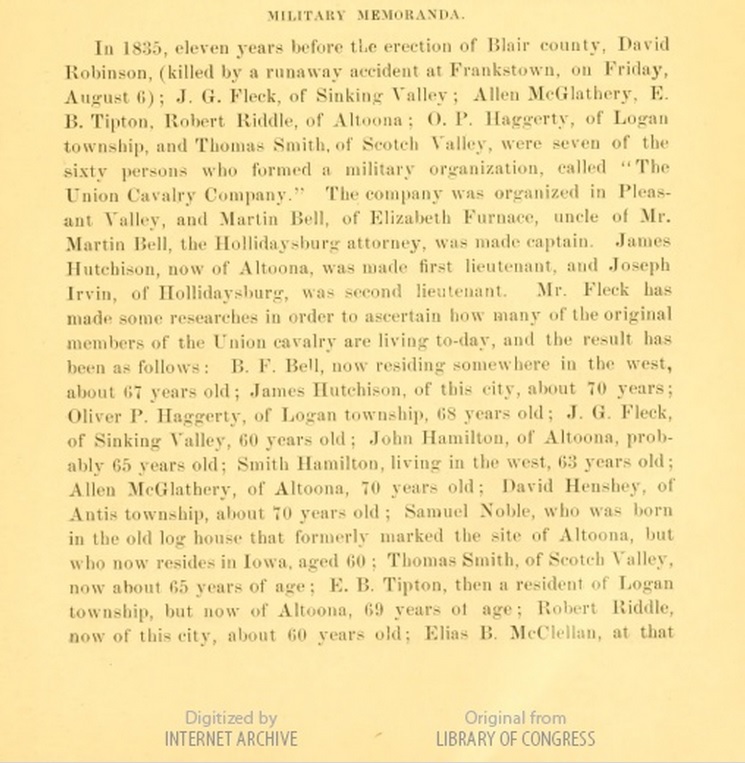 “The History of Blair Co. PA” 1810-1850 James Jr. owned 150 acres valued at $250.00 1843 James Jr. served as appraisor for the twp. “The History of Blair Co. PA”1830 Mary owned 30 acres, 1 horse & 1 cow. According to a wedding certificate\Application, James JR was born in Ireland (his son Samuel G Hopkins’). It notes that James was of Scots-Irish decent. He was probably a descendant of the Ulster Scot Plantation in the 1700’s. These people were Scottish transplants to Ireland. 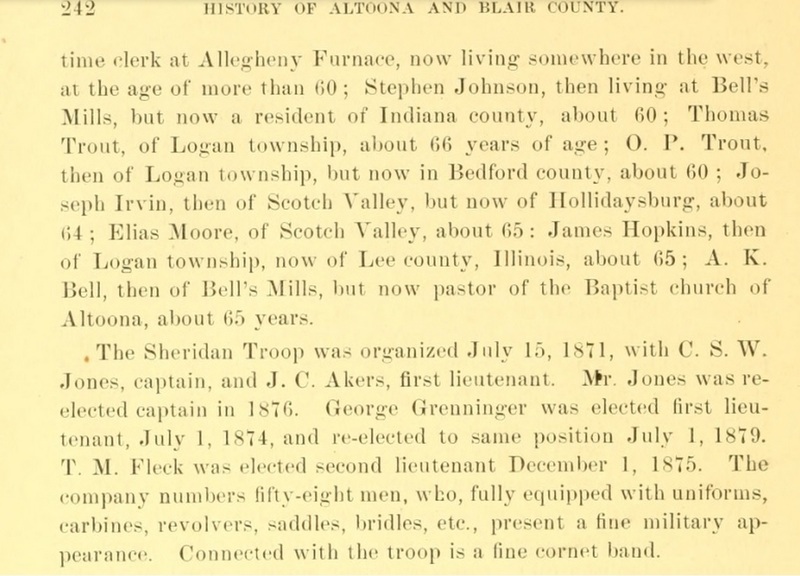 Noted in the Book “History of Altoona and Blair County” is noted (pg 242) to be a member of the original 60 persons of the Union Cavalry Company to protect the area. Another one of his sons, Samuel G Hopkins left to California during the beginning of the gold rush and lived an interesting life, found HERE.